TEHRAN, July 26 (AFP) - Three important lakes in the northwestern region of Mahabad have dried up as a result of this year's unprecedented widespread drought, the official IRNA news agency reported Wednesday. Homan LA, Iranian gay and lesbian rights group, writes: Thanks for publishing the article [from Rah-e Kargar] written by Mr. Babak Moshtagh on homosexual rights in Iran. Homosexuality is a topic that is not discussed much in the Iranian community. We need more education and discussion on this issue. 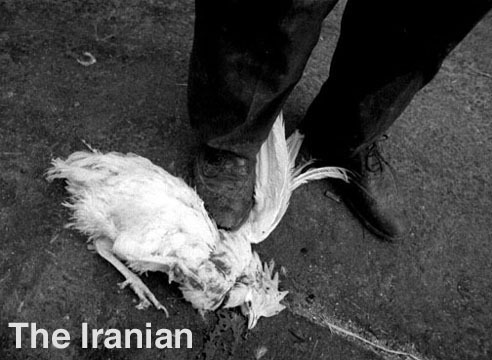 Arthur Aunch writes: Please consider changing the front-page photo of The Iranian (the foot and the chicken) with something that represents our culture better. I was commented by some Americans on this. Please represent our culture with more respect. Narguess Farzad writes: How could I have missed all his witty gems until this morning? I thoroughly enjoyed his spot-on observations and relished the delivery: damet garm, dAyi Hamid. However, I notice that his last missive is dated September 1999. Where is he now? Maybe the "Two Stripes" were not a false alarm after all and he is in some supermarket, contemplating the benefits of Pampers versus Own Brand of nappies, and wishing those stretch marks would just disappear. Or, have I simply missed his latest? By the way, I saw this quote in the paper yesterday: "Do not follow where the path may lead; go instead where there is no path and leave a trail." (Ralph Waldo Emerson) Interpret it as you wish! Please attend a commemoration ceremony for the late poet of Iran, Ahmad Shamlou (A. Bamdad). Moslem Mansouri will show parts of his documentary "Shamlou: The Poet of Freedom" along with poems from Shamlou with his own voice recorded in Iran. We will talk about Shamlu's last years of life in Iran. Time: Saturday, July 29t, 6:00 p.m. to 9:00 p.m. Place: 1200 Rolfe Hall, UCLA (North side of the campus- use parking structure 2 or 3). The program will be in Persian. Like a snake encharmed, I turn and twist. What is this knot, this dizzy maze, this snare? All I know: if I'm not tangled here, I don't exist. Here's the promising start of a multilingual resource that aims to "create a deeper awareness and understanding of Asian cinema" with an in-depth look at the cinemas of China, India, Japan, Korea, and Taiwan. Ageh saayt-haaye digeh nimroo baashan, [the] iranian Pamela Andereson-e.